Arundel Castle: Where is it? When it is open? Are dogs allowed? Arundel Castle is a restored and remodelled medieval castle which was established by Earl of Arundel Roger de Montgomery on Christmas Day 1067 and is open to the public. Situated in magnificent grounds overlooking the River Arun in West Sussex, the castle was damaged in the English Civil War and then restored in the 18th and 19th centuries. Today the castle remains the principal seat of the Dukes of Norfolk, the dukedom currently being held by the 18th Duke, the Earl Marshal of England. Most of the castle and its extensive grounds are open to the public from March to October. There are a number of events held throughout the year including the popular International Jousting and Medieval Tournament week. When is it open to the public in 2018? The restaurant and coffee shop is open 10am to 4.30pm and last admission is 4pm. What is open to the public at Arundel Castle? Gardens: From the architectural splendour of the Earl’s Garden to the bountiful kitchen garden and the wonderful Stumpery. Fitzalan Chapel: The chapel sits within the grounds and was built in the 1890s of Purbeck marble, chalk and Painswick stone. The Keep: After climbing the 131 steps up to the Keep, the views of the River Arun, the sea, the town and the Downs are worth the effort. Access closes at 4.30pm, or sooner if dusk falls early. Castle: The rooms of the castle include The Barons’ Hall which is a tribute to the signing of the Magna Carta. There are also bedrooms on show featuring furniture especially commissioned for Queen Victoria and Prince Albert who stayed at the castle. Nearest carpark: There is a pay and display car and coach park directly opposite the castle entrance (Mill Road Car Park). No - only registered assistance dogs are permitted into the castle grounds. Can a pram or pushchair be taken into the castle? Prams and pushchairs need to be left in the ‘buggy park’ on the lower ground floor at the main visitor entrance. Is the castle a wedding venue? 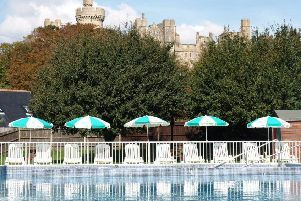 Arundel Castle Trustees Ltd, a registered charity, which is dedicated to the long term preservation of Arundel Castle. What has been filmed at Arundel Castle? Arundel Castle has been used as a filming location for several television and film productions including in 1988 for the Doctor Who serial Silver Nemesis, where it doubled for Windsor Castle. It also doubled for Windsor Castle in the 1994 film The Madness of King George. Arundel Castle was also a location for the 2009 film The Young Victoria. What’s on at Arundel Castle in 2018?